Who says you can’t grill your salad? The nice weather is still here, don’t put those grills away before you try this delicious simple dish. It is easy, light and loaded with flavor. Juice 2 lemons into a mixing bowl. Add black pepper, and a tablespoon of dijon mustard. Then add 1 1/8 cup graded Pecorino Romano or graded Parmesan cheese. Stir to combine. Slowly add in 1/4 cup of extra virgin olive oil to the bowl whisking constantly to emulsify. Keep a little extra dressing to spoon over after cooking. Cut 2 large heads of romaine lettuce in half. Add a good sprinkle of your cheese, making sure to get plenty in between the lettuce leaves. Now spoon your dressing over the romaine halves again, making sure to get in between the lettuce leaves. Drizzle a little extra Extra Virgin Olive Oil on top just before grilling. On a hot grill place heads cut side down and close lid. Cook for 5 to 8 mins depending on how hot the grill is, then flip and cook for a few minutes longer. 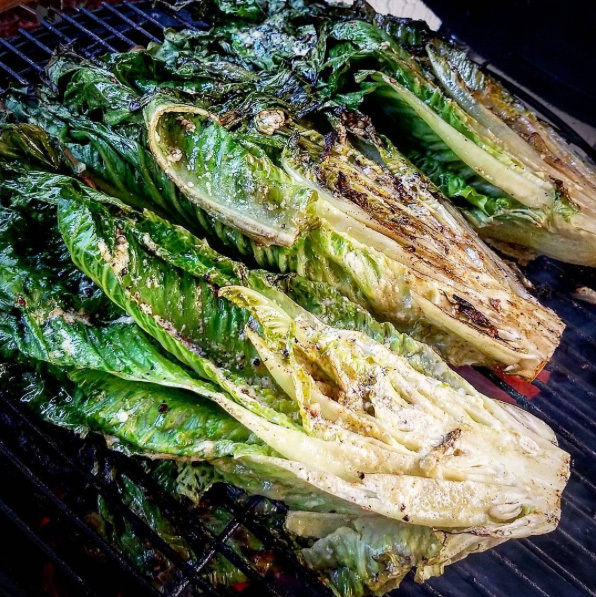 The romaine should have nice grill marks and should start to look wilted. Be sure not to burn. You will know when second side is finished when lettuce tips look limp. Then you can remove from the grill. Place on a platter and drizzle left over dressing, serve immediately.